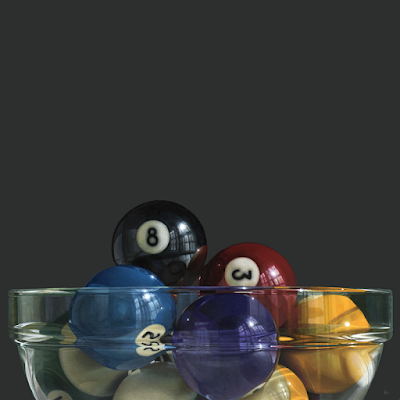 I've still been juggling a bunch of frying pans here lately, but I was finally able to complete this bowl of pool balls for Rehs Galleries in NYC. It was nice to actually have a request for this subject. It's one I've done quite a number of times, but never tire of. At least not yet. Now I've got to get going on a piece for Arcadia. I've got a few compositions to choose from but haven't made a decision. Hopefully I'll be back at the easel at work on what ever that will be in the next day or so.